One of the best reality tv shows I have ever seen has to be 'The Dog Whisperer' with Cesar Millan. When you first watch it you might be tempted to think ... so there's a family with a dog that has issues; what's special about that? Well, of course there's nothing special about it - it's the man who solves the problem that's special. The more you watch the show the more you realise what an innate sense of 'being in the moment' Cesar possesses. What's more, he claims that dogs live like that - they are able to let go of the past and just deal with the present moment which is why they can be rehabilitated. Fascinating! So what's this got to do with ice cream? Well, it's my view that anyone who believes in living for the moment and is passionate about life is likely to enjoy ice cream ... because ice cream is an intense 'being in the moment' experience. Did you ever see anyone eating an ice cream that didn't smile if they catch you looking at them? That's what 'being in the moment' is all about! Back to Cesar Millan - does he like ice cream? YES he does. His favorite is Butter Pecan. He was asked the question by a little girl called Sonny Milo - see this and her other questions listed on Cesar's website here. My Butter Pecan ice cream recipe is currently #1 on Google so there's every chance that one day Cesar just might chance upon it - you never know! It's one of the most popular downloads on the entire ice-cream-recipes.com website - moreover, it's one of my favorites too. 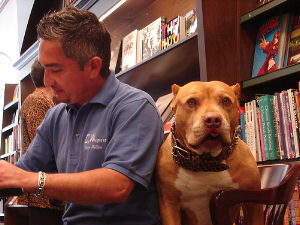 Keep up the good work Cesar - I'm a big 'Dog Whisperer' fan!